Some of the best things of the year happen in fall. It's my favorite season. Can you blame me? I live in beautiful New England where we wait for fall all year. 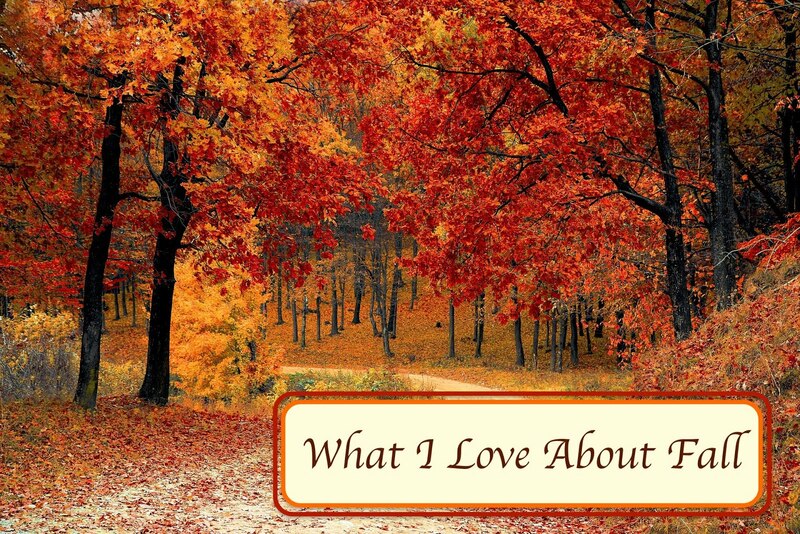 There's apple picking, pumpkin picking, pumpkin carving, pumpkin-flavored everything, crisp walks, jumping in the leaves, Halloween, Thanksgiving and so much more! Here's a roundup of some of my favorite activities and recipes that are just perfect for fall. One of the things we do to kick off the fall season is a family day at the orchard. Last year we spent time at a couple orchards, but this one is my favorite. I buy apples here throughout the season and make many recipes with these tasty local fruits. Click the link above to read about one of my favorite places of all time. These recipes are time-tested and family approved. Try any one of them and you surely won't be disappointed. I'm always looking for new recipes, so if you have a good apple one you think I'd like, share it in the comment section below. Healthy recipes are a bonus! I may even do a recipe review and let you know if I like it! Not long after the apples have appeared pumpkins steal the show. Unlike my recipes made with fresh apples, most of my pumpkin recipes call for canned. I do cook with fresh pumpkins as well, but they are much more tedious to deal with than fresh apples. Typically I start making pumpkin recipes long before we head to the pumpkin patch in mid October. In fact, I made this bread just the other day! 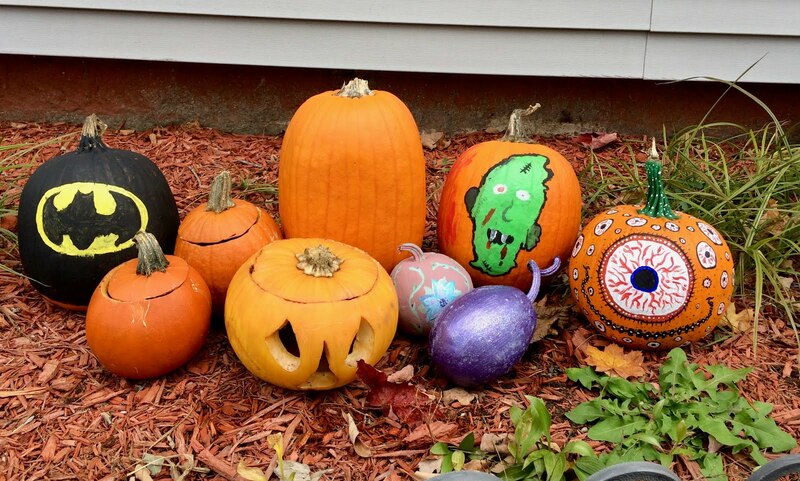 Carving and decorating pumpkins is also one of our family's favorite traditions. Here are the one's we made last year. Can you guess who made each one? Autumn is the perfect time to crochet. With a slight nip in the air, you can cuddle up with your current project on the couch. Here's a blanket that works up quickly and easily, and could be done by Christmas with time to spare. Follow this link so you can see how it's made. If you've never crocheted before, fall is the perfect time to learn! Try these for your Thanksgiving Feast! Thanksgiving is one of my favorite holidays. I think it might be beat out by Christmas, but just barely. We have some fun Thanksgiving traditions in our family. Some are typical like turkey and pie. Others are not so typical, like Bingo. Everyone in our family has a great time on Thanksgiving! Here in New England winter rolls around just about the time Thanksgiving finishes up. Christmas gets me through the cold season and hopes of spring once the new year begins. But fall in New England will always be my favorite. Do you have any favorite autumn activities? A favorite fall recipe to share? Pumpkin spice or anything nice? Share it in the comment section below! Also, today is day two in the Ultimate Blog Challenge! Check it out! I think there's still time to join! I have always wanted to visit a Apple Orchard with my son or a Pumpkin patch and haven't done either. As for Thanksgiving I used to love it as well although it is a hard Holiday for me now as it is when my daughter was killed. But I do love Halloween and all the Pumpkins you all made. As for the Blanket I loved it but no, I don't Crochet but my sister does so I will share the pattern with her. Maybe this year you can visit one! So sorry to hear about your daughter. I can't imagine how hard that must be. Thank you for your comments and for sharing with your sister. Fall has always been my favorite as well!! I grew up in Maine. My family had many of the traditions yours does. Apple picking is still something I love even though my children are now grown with children of their own, and they live half a country away from me. We grew our own pumpkins. Family carving and painting comprise some of my favorite memories!!! I don't ever think I'll give up apple picking and pumpkin picking. It's such a simple thing and so much fun. I never grew my own pumpkins but I'd like to give it a try. Now that we live in a new house, I think I might plant some next May. Do you have any recommendations on types to grow? Love the recipe round ups...great treat for me the reader. Glad you like them. Once I built more content into my site I started doing them, but I wasn't sure if people liked them. My goal is to make everything easy to access and user friendly. Thanks for the comment! How many good things you've packed into such a small space. I'll have to check out those apple and pumpkin recipes. I love apple season! I love all of autumn. Thanksgiving is my favorite holiday. Thank you! Thanksgiving is great. I really love Christmas but it does pack its own set of stressors. Thanksgiving seems so much less stressful and therefore more easy to enjoy time with family. I hope you find a recipe you like!